Ryan Miller had an easy time in the first period Wednesday night. The same can’t be said of the final 40 minutes. 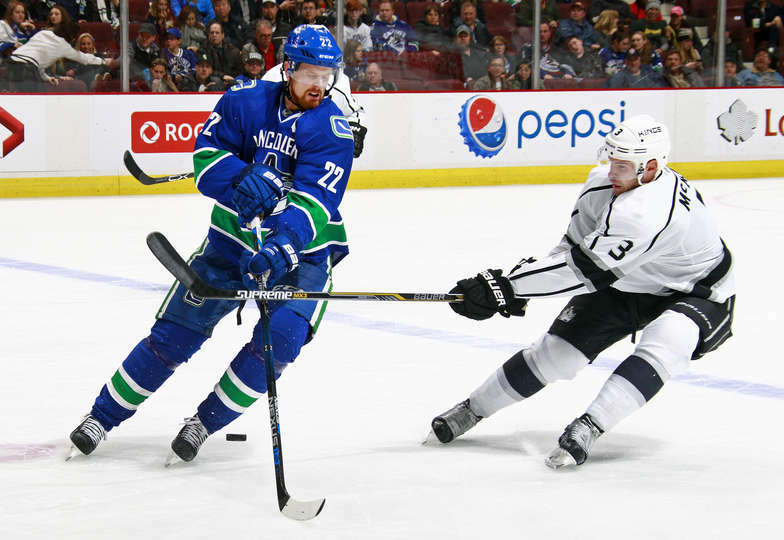 Miller made 36 saves and the Vancouver Canucks edged the Los Angeles Kings 2-1 in the first game for both teams following the NHL’s Christmas break. The goalie was unbeatable until late in the third period as the Kings outshot the Canucks 37-20 – including 31-8 over the final two periods. The Canucks (15-18-3) earned their second win in the past five games. The Kings (17-14-4) lost for the fourth time in five games. Loui Eriksson and Henrik Sedin scored for the Canucks, who converted one of three power-play opportunities while denying the Kings on two. Tanner Pearson scored for Los Angeles. Peter Budaj took the loss while stopping 18 shots. Vancouver’s goals came early in each of the first two periods. ”You never want to get down that quick behind the 8-ball, and we just couldn’t bury that second one at the end of the game,” Pearson said. Eriksson opened the scoring on a power play 2:43 into the game as he skated the puck out of the corner and beat Budaj with a shot to the far side. The goal came after Bo Horvat, battling a Kings defender along the boards, gave a between-the-legs pass to Eriksson. With the goal, the Canucks ended the Kings’ streak of consecutive penalty kills at 26. Kings defenseman Jake Muzzin was off for high-sticking Eriksson at the time. Los Angeles had gone nine games without allowing a power-play goal. Heading into the game, Vancouver’s power play ranked second-to-last in the NHL with a 12.5 percent success rate. With the Kings forced to kill three penalties, including two committed by Nic Dowd, the Canucks outshot Los Angeles 12-6 in the first period. Sedin doubled Vancouver’s lead 23 seconds into the second period when he deflected in Troy Stecher’s bouncing shot from the point. The goal was the only one of a raggedy period in which the Kings outshot the Canucks 13-4. Miller stood out as he stopped Trevor Lewis in close after a Vancouver giveaway at the blue line and robbed Dustin Brown on a one-timer off Anze Kopitar’s sharp-angled shot in the late going. Pearson scored at 16:43 of the third period, depriving Miller of his first shutout in more than a year. He has gone 67 games without one since blanking the Kings on Oct. 13, 2015. Desjardins also praised defenseman Alex Edler, who delivered a strong effort in his return to the lineup after missing 11 games with a broken finger. NOTES: Kings forward Devin Setoguchi played in his 500th NHL game. … Canucks forward Alex Burrows is one game shy of 800 in his career. … Kings D Drew Doughty has played in 199 consecutive games. He has not missed one since 2013-14. Kings: Play at Edmonton on Thursday night to end a run of nine straight road games. Canucks: Host Anaheim on Friday night.